Yesterday was so beautiful out that I couldn't resist. I took the afternoon off and went kayaking! I invited John and Chuck to make it a Pierre Kayak Club event but they are salaried so they have to use 8 hours every time they use leave. ...and John, in his words, has too much of a conscience to just call it a day at noon. I went paddling this evening... surprise, surprise... and I took what may be one of my best pictures to date! I went kayaking on both Saturday and Sunday, though on Saturday I forgot to grab my camera and gps on the way out of my apartment. Hopefully, I can get John Adler's pictures from Saturday, until then, here are my pictures from Sunday. We went around La Framboise Island, starting at the Legion and heading upstream on the river side to the causeway. A few pictures from an evening cruise last night. Nothing fancy, just around Dump Island and back to the Legion. This past weekend I didn't go kayaking, but I spent plenty of time outdoors. I took a Pierre Boy Scout troop backpacking in the Black Elk Wilderness area around Harney Peak. We started from Horse Thief Lake. On Friday night we hiked in a quarter of a mile or so and camped. On Saturday, we took the Horse Thief Trail south to Grizzly Bear Ck trail. Then we headed west to the Harney Peak trail. After coming back down from Harney, we continued north to the Willow Ck trail and then back east to Horse Thief Lake. A good time was had by all. I think we might end up doing a 50 miler sometime this spring or summer! Yesterday the "Pierre Kayak Club" did another section of the Missouri River near Pierre. This time we tackled from Twin Bridges to DeGrey. View Larger MapWe shuttled my pickup and Chuck's Geo down to DeGrey; DeGrey is a river access (boat ramp and vault toilet). The trip ended up being ~9 miles (averaged between John's and my GPS). You'd think that going downstream would be easy, but from NOAA's site I see that we faced a south east wind at 13-15mph with gusts up to 22! When we stopped paddling, we would be pushed backwards. Not too much else to say about the trip. I have a few pictures of foliage, but mostly of Chuck and John. Not too much to see on this stretch. Look at the "air" under John's boat. Last night I got back from the south east corner of SD. On Friday, John Adler and I met down at the Chief White Crane State Rec. Area near Yankton. One bit of bad luck did occur; one of my tent poles developed a crack and the zipper on the door broke. After struggling with the zipper, I gave up and went into Yankton and picked up a tent at Walmart. Not the best expedition tent, but it performed well. The tent that had issues was a Wenzel. I am going to contact the company to get replacement parts, but I think I might start looking for the tent I really wanted when I bought it... a Kelty Grand Mesa 2. Back to the trip. The forecast was for a decent Saturday but high wind advisories and likliness of thunderstorms convinced us to use the Clay County Rec. Area as our take out. Initially, we planned to camp at Bow Creek (undeveloped National Park Service land). We shuttled my pickup downstream at 7 AM, then got the boats loaded. We launched at 10AM. The going was easy, thanks to a faster current than I anticipated. The wind, on Saturday, was low or nonexistant. The trip got sweeter (for me) as we approached Yankton. The Discovery Bridge opened on Saturday and with that the Meridian Bridge closed. As we passed the structures, traffic was still on the Meridian, but there were many people on the Discovery and we could hear someone giving a speech over a loudspeaker. Just past Yankton, we ventured around the point of Rush Island to checkout something we saw and could not initially identify. With the great time we were making downstream, we decided to stop at the St Helena boat access for lunch. And not a cold lunch either! We took the time to pull out our stoves and have a hot meal. I had beef ramen (reminiscent of my college days) and John had flavored rice. At St Helena, we also saw the below sign about the Missouri National Recreation River. Apparently, personal watercraft are banned on this stretch. I knew I liked it for a reason! After about a hour... maybe a hour and a half, we moved on. I think I saw more herons on this trip than any other time! We did get rained on in the afternoon and quite heavily for, maybe, ten or fifteen minutes. As we approached what I thought was Bow Creek, we saw a creek, a burnt out building, and a poorly maintained boat ramp. We decided that this was not Bow Creek after consulting with some aerial photos I had printed for the trip. A little further down we found what we assume IS Bow Creek but could not find anywhere suitable to setup camp. And with the poor forecast for Sunday, we chose to push on to Goat Island. On the upstream end of Goat Island, we beached our boats and explored a bit. The location was not great for setting up camp, but we were surprised to find a pickup camper mounted to a small trailer in amongst a somewhat heavily wooded area. Due to it's condition, it had been there awhile. We continued along Goat Island until we found a suitable camp location. Our aerial photos helped significantly in this regard. The first day we put in 24.7 miles. We weren't pushing ourselves at all and we had limited day light compared to a summer trip. Actually, we could have done the whole trip in one day, but by the time we started cooking supper it was getting dark so this worked as a nice campsite. For supper, I had Dinty Moore Beef Stew and John had some Campbell's Chunky Soup among other things. I think we both slept well that night and were both up before sunrise. I had oatmeal for breakfast and John had a Mountain Dew. We were back on the water at sunrise. We were on the water for less than an hour before coming to the Clay County Rec. Area. We put 4 miles that morning, giving us a total of 28.7 for the trip. 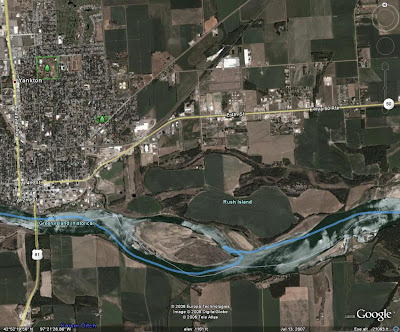 Hwy 34 to Hwy 63 (Cheyenne River) I did this one by canoe when I was in Jr High. An excellent idea would be to have a SDCA cruise from Gavins Point to Ponca State Park. Anyone wanting to just paddle a portion of it could find another take out easily. ADDED: A slideshow of the pictures John Adler took. Yesterday I made the trek to Sioux Falls, Brandon actually, for the Split Rock Creek SDCA cruise. Earlier in the week, it was sounding like we would have to shorten the cruise because Split Rock Creek was running low. But once we got there the creek looked similar to last year (paddlable with only a few portage spots). I should add I was considering not coming on this cruise, but I wanted to pickup a backpacking stove for next weekend so I used that as an excuse to travel to SF. I don't regret it; I got my backpacking stove at The Sportswarehouse for almost half what I probably would have paid at Scheels. Possibly a lower model but that is fine with me. It will do what I need it to do. The trip came in at around 8.5 miles (I read 8.65 on the creek, but after I cleaned up the track data it looked like 8.4 so I will average :) ). I had a blast on the trip. Defiently an improvement from last year when I tried to take my tandem down it with a friend. That worked out in the end and was fun, but early on was rough going. Yesterday I only needed to get out once at the point where the Split Rock dumps into the Big Sioux... seemed to be completely silted in, though I may have just missed a channel too. I believe we had 12 or 13 paddlers with one young woman having to depart early. I hope she continues to kayak and is able to complete the trip next year. It seems this blog is viewed by more SDCA members than I realized. It seems that if I plan another camping trip next year. I might have more interest. It also sounds like a few people are interested in joining John and I for one day of our paddling next weekend. I think the best fit for this would be from our put in at the Chief White Crane Rec Area to St Helena, NE. Our goal is to camp Saturday night around Bow Creek but St Helena is an emergency campsite (weather, etc.) and a good place for a break from paddling during the day. With just over 2 weeks until the big trip on the Missouri River from Gavin's Point to Vermillion (subject to change), I am posting the current plan of action with contingencies.Currently, there are three people committed to the trip, John Adler, Arnold Lund, and myself. I have heard from two interested people through the power of the Internet, but I am not sure on their decision. Arnold might not get up to White Crane until late Friday evening (unless he flexes that week). So it might be up to John and I to shuttle vehicles or wait until Saturday morning (with the short distances that might be an idea). If we shuttle John's Chevy Tracker on Friday evening, I could have my sister move my pickup down to the take out though she probably couldn't get to it until Sunday. Final shuttling options will be decided Friday (October 10) evening.For anyone wanting to join us, we will be camping at Chief White Crane State Recreation Area on Friday evening. Look for the kayaks. The plan is for everyone to carry their own gear and rations. Between John and I, we are supplying Arnold with gear for the trip. I plan on having numerous 1L bottles of water for the trip. That should be plenty for me. I might procure some more bottles or try to rig a way to carry a 2 gal. jug along too. No such thing as extra water. I plan on taking instant oatmeal, ramen, canned stew, trail mix, granola bars, and of course coffee along. The trip itself has few changes. Distances are all from Gavins Point. 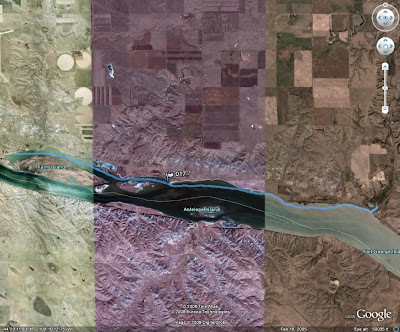 First distance is measured in Google Earth, second is from the SDGFP/NPR. Meet up and camp Friday evening at Chief White Crane State Recreation Area. Shuttle vehicles either Friday evening or Saturday morning. Mouth of the James River (9.5 miles) Possible side trip. For good weather the trip is likely to take just two days with camping around Bow Creek or Goat Island, but other campsites are shown for the potential of high winds and rain, as well as, side trips distracting us. The plan is to say 3 day trip and if we finish sooner, oh well. Cell phone reception should be adequate along this section of the river too. Arrr, Don't ye be forgettin' International Talk A Pyrate Day! Yesterday the Pierre Kayak Club took a cruise from the Farm Island beach to twin bridges. Twin bridges is the name that locals call the point where Medicine Creek empties into the Missouri River. 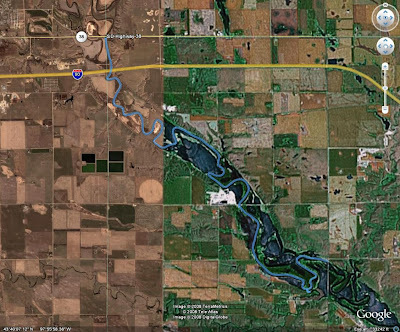 There are two highway bridges at the location; one overpasses the railroad as it turns away from the river and the other crosses the creek/river. There is also a third bridge where the railroad crosses the creek. My gps read that I covered 11 miles on the day, though after 4.5 miles we got an extended break. A thunderstorm blew in and we had to wait approximately 30 minutes on the shore for it to pass. Luckily we had splash jackets with us... and John and I learned that spray skirts do a decent job protecting our pants in a rainstorm! Chuck found a second use with his pop up sail... as an umbrella! After we got underway again the going was fast, though difficult for John and I. We were with the wind, but we had to fight to keep from being windcocked. Chuck started playing with his sail... and his rudder kept him straight. Though I did hit 7 mph keeping up with Chuck! Along the way we didn't see much for wildlife... they knew the storm was coming better than the weathermen? We did see a seagull or two and a great blue heron. A slideshow of my pictures is below... just click the slideshow to see the albulm at Google's Picasaweb. John Adler and I have decided to add contingencies to this trip. My sister is living in Vermillion while at grad school and John's wife and father-in-law will be camping near Yankton. Also, we will have decent cell phone coverage on the river. When we reach St Helena, we will decide if we want to push for Goat Island on the first day. Dependant on how much side exploring we do as well as the weather conditions. We can also have my sister move my pickup further downstream if we want to lengthen the overall trip. There is also a primitive campsite at Bow Creek, 1.5-2 miles upstream from Goat Island that we can use too. Meet and Camp at Chief White Crane State Rec. Area on Friday, October 10. Shuttle vehicle(s) to the Clay Co. access. Depart on trip Saturday morning. Take time to explore shoreline. If passable, consider a brief cruise up the James River. Arrive at the St Helena Access and campsite. Make decision on if we camp at St Helena or push for Goat Island. Also, decide if we want to change the destinations from Clay Co. access to the access near the SD 19 bridge or the Bolton Bend. Make arrangements by cell phone to have shuttle vehicle(s) moved, if necessary. Eventually, arrive at Goat Island and camp. Take time to explore the island. John Adler says that there are geocaches on the island. I am planning a paddling and camping trip from Gavins Point Dam to Vermillion over the Native American Day weekend in October. A guide can be found on the Nebraska Parks website. Anyone interested, please let me know so I can plan for you. Jarett, feel free to post this on the SDCA blog... the more the merrier! Meet at the Gavins Point Tailwaters campground. Move my pickup (maybe more) to the takeout near Vermillion. 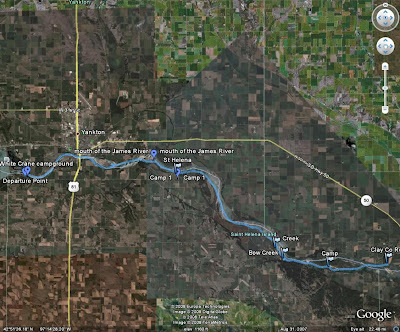 Paddle approximately 14 miles to campground and boat access near St Helena, NE. Paddle approximately 21 miles to Goat Island. 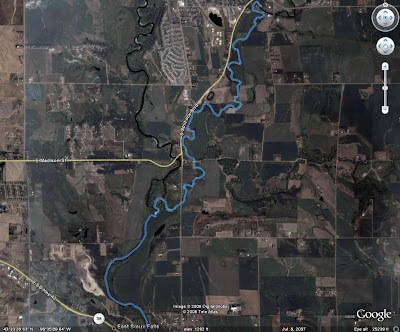 Paddle 3-4 miles to boat access near Vermillion. Retrieve vehicles left at Gavins Point. Yesterday, I drove to Mitchell for the most recent SDCA event. We were paddling the James River. It turned out to be a terrific time spent paddling. As one paddler put: good day, good times, good company. The total paddle turned out to be approximately 11 miles. My gps read 11.2 (including a brief jaunt up a tributary and John's read 11 flat. Since the google earth image is not of great quality, I'll add a map with the route from Map Source (Garmin program). Not too much wildlife was seen, though I caught a glimpse of either an eagle or a vulture. I didn't get a very good look so I can't be certain. Plenty of cattle along the way though. Water levels were good for the whole trip. There were occasional spots with a few rocks but nothing that could be thought of as problematic. What I really enjoy about the SDCA trips is meeting fellow paddlers and chatting/BSing along the route. I made at least one new acquaintance, Ryan from Sioux Falls. And I let a few folks know about my plan to kayak/camp along the Missouri River in October (more details coming in a later post). Jay Heath also asked me to give a presentation at the SDCA conference in January, which I replied I was willing. Should be fun. As per every SDCA event, I had someone ask about my rack, which, as always, I enjoyed discussing. Well, I haven't been posting much because most of my recent paddles have been short simple jaunts around Dump Island. On Wednesday and Thursday, I went out to play in the waves though. Both evenings Pierre has wind gusts over 30mph. On Wednesday, Chuck went out with me and on Thursday, John went out with me. We all had a blast. Surfing waves... waves crashing over the bow... a blast! Last night Will Coolidge and I went out for a short night paddle. He attached a small beacon to his Pamlico 14 and I attached my newest toy to my Carolina 14. I also had a headlamp strapped to my hat. We only spent an hour max, possibly less, on the water. But it was quite enjoyable. I need to work on adjusting my camera's settings to find a better setup for night pictures, but I did have some turnout alright. Today I paddled with other SDCA members in a Big Sioux River cruise. We put in north of Lake Alvin and took out at Klondike, IA. The paddle totaled 8 miles and was a very enjoyable cruise despite some bad news for myself. I had planned on meeting my friend, Arne, and taking him along; then camping at the Palisades. Well, that fell through when he had car trouble and had to return to Lincoln, NE. I kept in touch with him during the day and he will be getting a new car soon. There wasn't anything major wrong with his but enough minor things to out weigh the value of the car. With him out of commission I decided to skip the camping and return to Pierre tonight. Though it does allow me to update my blog sooner! Like I said the paddle was very enjoyable. As for scenery, I liked this stretch much better than the Flandreau stretch of the BSR. I managed to catch site of a fawn, bald eagle, and possible some turkey buzzards. Also, some cattle. I am not sure how many boats we had but at one point before putting in I counted 19. Though Arne was absent, the boat I borrowed for him to use did not go empty. A woman that had planned to ride in the middle of a canoe took it down the river. The boat was a WS Pamlico 14. I have a slide show of my pictures below (128!) and within it I took a picture of what appears to be the remains of what may have been an old river crossing (concrete remains). Anyone know the story behind it? The take out went quite smoothly despite only room for two boats at a time. We probably could have squeezed a few more at a time, but a few locals were fishing. On Wednesday, a quick paddle around Dump Island by William, Chuck, Will's brother, and myself. Uneventful, except that we fought through the wind on our way down, but when we turned to come back the wind died off. Chuck had planned on using his kayak sail on the way back. He used it anyway but fell way behind the rest of us. Pictures in the slide show. Last night, Chuck took his new QCC 700X out and Will and his girlfriend paddled my tandem. John was there too. Funny thing, we had four boats and four different brands out last night! Pictures are in the slide show below. Also, note that you can turn the captions on by clicking the text box/bubble in the bottom left corner of the slide show. I went out paddling this afternoon with Will Coolidge. I decided it had been long enough since I had the tandem out , so I took the ever fearless seadog, Scruffy, along with me. We put in off of the causeway (to La Framboise Island) and paddled upstream. The total trip ended up right at 5 miles. Our destination is a small island/sandbar with a few trees and shrubs. I have dubbed the isle: Pallet Island because there are a number of pallets laying on along it. Size comparison: Will in a borrowed WS Tempest next to the Pierre-Ft Pierre railroad bridge. This is the span that used to rotate out to allow steamships to pass. We saw many kayakers out today. It was a good sight, but this one baffled us a bit. If you look close this paddler has his/her boat standing on end! On Thursday, I went paddling with a friend and his brother. They borrowed another Pierre Kayak Club member's tandem (much larger than my tandem, btw) and we paddled around La Framboise Island. We took the little inlet that I enjoy. I had no problems but their boat struggled towards the end... not enough water. So they missed the below sight that I captured: two deer crossing the dam-like structure at the end of the inlet. A picture of Will in front of the remains of an old building. Afterwards I let him practice wet exits with my kayak since I had my skirt along and he missed the last time. On Saturday evening Will, Chuck, and myself went out for a Bad River excursion, totaling 6.5 miles. I paddled around La Framboise Island last night. It was enjoyable paddle and the critters were numerous! First was a buzzard of some type. I am no bird expect, so if anyone can tell me what it is for certain I would be appreciative. If I were to guess, I'd say a turkey buzzard. Wikipedia just informed me that the Turkey Buzzard (or Vulture) is the most common type, so that is probably correct. That was the closest I have ever managed to get to a buzzard... not that I can get much closer t than I did last night. Later in the trip, I entered the small channel between a sand bar and the island proper. For the first time in weeks there was enough water to get through. I was unable to get my camera up in time to catch a heron or crane as I entered the channel. Again I am not good with birds, so I am not sure what I saw. It was a wading bird and was mostly if not completely white. I also captured this nice photo of a fawn. He (or she) took off downstream ahead of me. Later on I heard a lot of rustling in the rushes and saw a duck come flying out as if being chased or spooked. I never saw what chased the duck up, but it seemed or I assumed it to be rather small from the sounds. I would guess some sort of small mammal. Not much later I saw a doe and fawn (possibly the same fawn) take off across the channel and into the island proper. On my return journey, along the Pierre side of the island I came across a couple with recreation kayaks enjoying the shaded water along La Framboise. I didn't have my gps with me, but from previous paddles I know the trip was about 6 miles, maybe a tenth or two above. Last night the Pierre Kayak Club went up to the Oahe Downstream campground and practiced wet exits. I managed to take a couple of video clips of the other two guys performing the wet exit. All three of us did well with the wet exits, so we will probably try to work on rolling in the future. If you haven't discovered it yet, there are some paddling comic strips online. The one I am referring to is Bubblestreet, though there are less than three years worth (2005-2007). On Wednesday evening the Pierre Kayak Club took a paddle around Farm Island. Ended up being about 7.1 miles. I took some pictures but they all turned out blurry. I cleaned the camera's case and the pictures turned out fine tonight. Scruff can ride on the new boat for short distances! And a pair of pictures of myself in the new boat. Today I took a trip around Farm Island (near Pierre). I put in at the boat ramp on the north end of Farm Island State Rec. Area and paddled down and around Farm Island, taking out at the beach by the campground. Then, showing off my macho side ;) , I carried my boat the 0.5 mile walk to my pickup! The paddle ended up being about 7.3 miles. But don't forget the added 0.5 mile walk to get your vehicle, I wouldn't recommend carrying your boat unless there are plenty of attractive gals around... there weren't very many for me but I wanted to know if I could do it... I can. A doe and her fawns. "Mom, where are you?! That blue floating thingy is looking at me!"